Woks are typically most associated with Chinese cooking, and are capable of performing a large number of cooking functions. 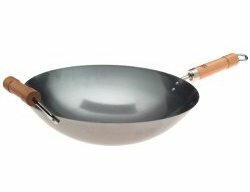 The larger size and higher slopes of a wok allow it to be used for boiling, braising, deep or pan frying and, most notably, stir frying. Woks are the best cooking vessel for stir frying because of their ability to retain a high level of heat, and their shapes allow for constant motion which results in better browning and flavor distribution. A wok is cooking vessel that features a high slope and round bottom that originated historically from the Guangdong Province in China. Woks are typically best used in conjunction with a pit stove or an outdoor propane burner. The shape of a normal household stove does not allow the rounded bottom of a wok to fully make contact with the heating element, thus reducing its effectiveness. However, there are flat-bottomed woks on the market that do allow for use with a traditional household burner. The Calphalon Unison wok is a favorite amongst users. The special Sear Nonstick surface from Calphalon locks in flavor and is perfect for stir-frying, but is also capable of other methods of cooking as well, including oven-based cooking. Users also appreciate the fact that the handle remains relatively cool to the touch while on the stovetop, and that it's completely dishwasher-safe, making cleanup a breeze. The Cuisinart Chef's Classic Stir-Fry pan is a 14-inch, stainless steel wok that can produce a great stir-fry at an affordable price. Users note that the pan heats up well and evenly and is dishwasher safe for easy cleaning. Additionally, the wok is oven-safe up to 550 degrees Fahrenheit, making it suitable for oven-based cooking as well. 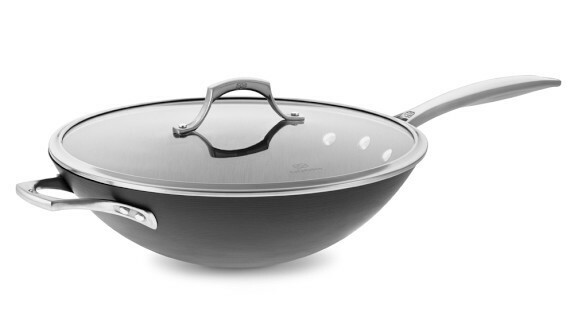 The Joyce Chen Pro Chef round bottom wok is a great choice for those looking for a traditional-style wok. The wok is capable of absorbing and retaining high levels of heat rapidly and the round bottom is best for the rolling and tossing motion needed in good stir-fry. Unfortunately, round bottom is not well used on normal household stoves and best used on a gas burner. 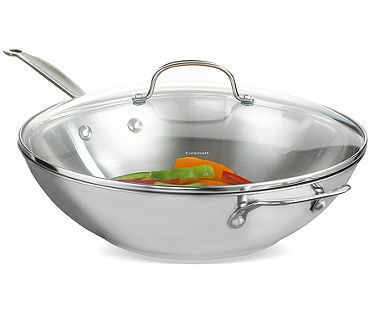 Despite this, users agree that, when properly seasoned, this wok is capable of producing highly flavorful food. 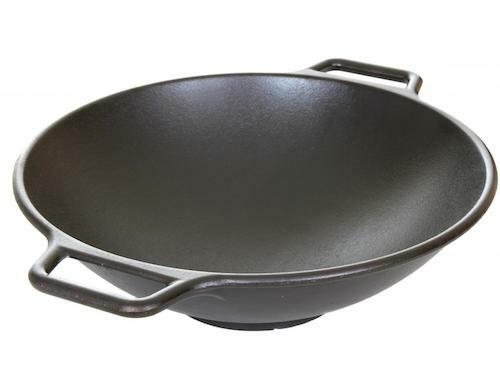 The Lodge Pro-Logic cast iron wok combines unique shape and cooking qualities of the wok and the superior heat retention and distribution of cast iron. 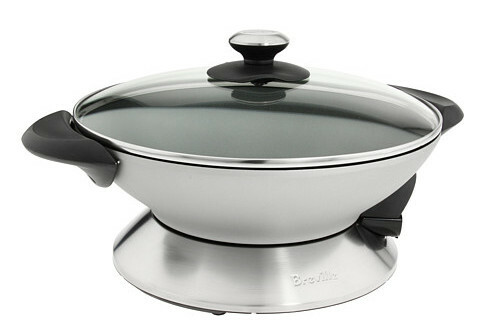 Users note that by pre-heating the wok on a stove, the wok is then able to retain enough heat for a proper stir-fry. Additionally, this wok also doubles as a fantastic deep fryer that requires less oil. All it requires is the same maintenance you would put into a cast iron skillet. For those of you who want wok-cooked food at home, but want to save the stovetop space, then an electric wok like the Breville BEW600XL might be the way to go. The BEW600XL features the rapid heating and superior frying and searing qualities of a wok, but comes with its own heating element that can reach 425 degrees. The bowl fits 6 quarts and can easily prepare a meal for an entire family. Finally, the dishwasher-safe bowl and lid make cleanup quick and easy. And those are our recommendations for the best woks. As always, be sure to check out the Wise Bread Buying Calendar to learn when and how to buy just about anything!